What I’ve enjoyed most about doing Whole 30 for the first time is that it forces you to try new recipes and go outside your comfort zone. I’m usually perfectly happy with my staple breakfasts of oatmeal and smoothies, Trader Joe’s frozen Indian for quick lunches, and veggie/bean burritos for dinner. BUT, there is a whole world of food out there and I’m always one to support changing up routines every now and then. So, I’ve been putting together a list of all the whole 30 compliant recipes that I’ve enjoyed the most. From breakfasts to quick dinners, to meal prep, here are my favorite tried-and-tested recipes! Sweet Potato Hash (The Real Food RDs) – minus the bacon in my case. Perfect Soft-Boiled Eggs (The Cutting Veg) – I can’t count the number of people I’ve shared this with, it makes the perfect *jammy* egg yolk! Whole 30 Bananas Foster: Sliced bananas with cinnamon sautéed in coconut oil (on medium for five minutes). Couldn’t find an actual recipe for this. 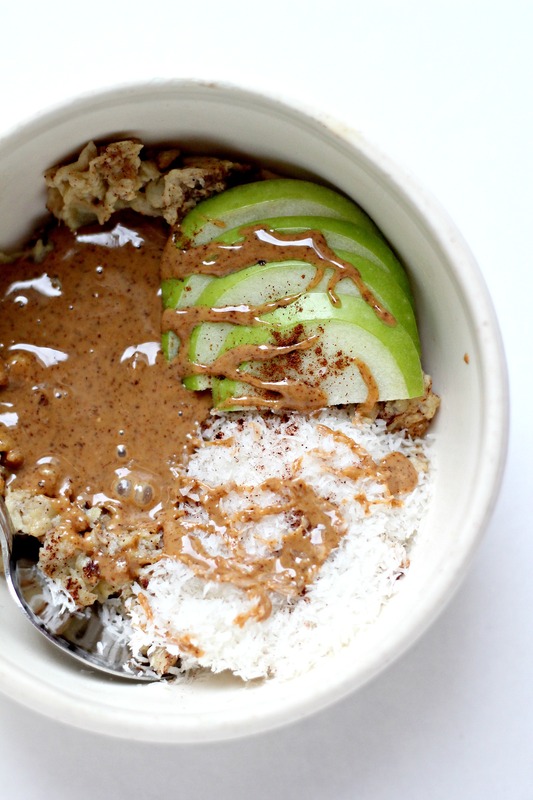 Option to use as a topping for a yogurt alternative, smoothie bowl, or just plain. So easy, so good! Here’s a paleo version recipe (Primal Palate) with coconut sugar. Eggplant Parmesan with Cashew “Cheese” (So Let’s Hang Out) – Have to put an extra plug out there for this one. It’s hands down my FAVORITE! I’ve made it several times already and will continue to make it after Whole 30. Word of caution: It’s a bit labor intensive, so there’s always the option to buy Siete’s Dairy Free Cashew Queso in place of making your own. Sugar is in EVERYTHING! I now have a whole new set of condiments with zero added sugar, because added sugar is in most common brands. Think: Primal Kitchen and Sir Kensington. Meal Prep is KEY! Taking 2-3 hours on a Sunday to prep lunches and dinners for the week was life changing. I’d meal prepped before, but never to the amount required when doing Whole 30 since you can’t rely on eating out when doing it. My husband and I have managed to sustain this habit and I don’t see this changing anytime soon! Variety is essential. Changing the recipes you make on a weekly basis is important to staying interested in eating healthy. I could never and will never be someone who meal preps chicken breast and asparagus cooked the same way every week. Eating out on Whole 30 was hard. Too hard. This was the biggest downside in my opinion and I honestly felt it made it difficult to have a social life. I hope that someday we have enough healthy options that eating out isn’t so difficult when you’re eating whole foods, but that’s not the reality today. I enjoy eating out with friends and family, and having a drink or two every now and then isn’t going to kill me – balance is key! Whole 30 was a great temporary reset. I could never sustain the diet, but doing it after the holidays got me back on track to eating healthy quickly, which gave me the energy needed to exercise and maintain a healthy lifestyle. We’re thinking about doing it again in June before summer vacations begin, so I might be jumping back on the Whole 30 bandwagon again before we know it!